Use the tabs below to explore information about the current and historic air pollution levels in this local authority. You can select another local authority using the dropdown menu. Select a monitoring site for this local authority from the dropdown below. Use the map above to explore the monitoring sites in for this local authority and the surrounding area. The table below shows a summary of sites within this local authority - you can click on the site names to get more detailed information. » An archive of LAQM reports from some of the Local Authorities within the Herts & Beds network. Reports are also available directly from the Local Authority websites. » Monthly mean concentrations from Local Authority NO2 diffusion tube networks. Bias corrected concentrations, annual means and LAQM reports are available directly from the Local Authorities. 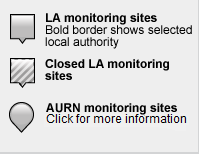 The following monitoring sites are no longer active in this local authority, but you can still access information about them by clicking on their names below. The free service that gives you air pollution alert for Hertfordshire and Bedfordshire area.